I hope you plan to be present at church this week for our Transfiguration Sunday worship service with Holy Communion, followed by a Mardi Gras lunch and celebration! 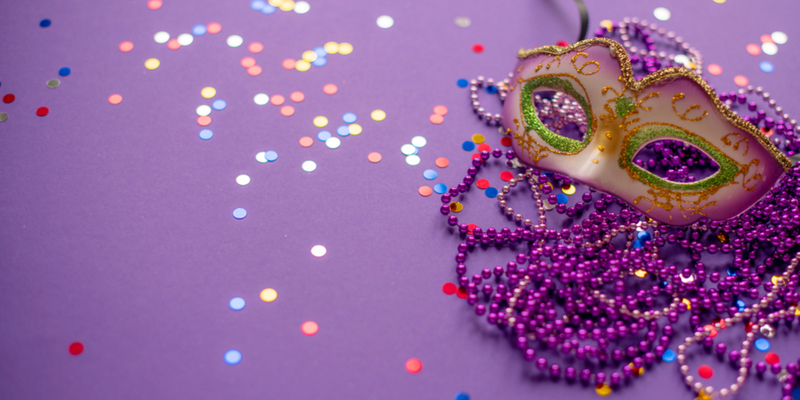 Although in New Orleans and around the world, the Tuesday before Ash Wednesday is the time of parades and masked revelers dancing in the streets, the last celebration before the Lenten time of fasting and self-denial, we’re doing it a few days early! We’ll enjoy authentic jambalaya prepared by Laphalle Fuller, Yvette LeGrand’s corn bread muffins, and King Cake in a Kelsey Hall, colorfully decorated in purple, gold, and green, by Karen and Dan Kett. There will beads and masks, and a piñata for the kids. At the end of the meal we will join together and put away the Alleluia until Easter. We don’t think much about the Mardi Gras masks except as a part of the old traditions. Symbolically though, they are marks of anonymity or disguise, worn deliberately and literally during Mardi Gras, but which many of us wear more figuratively throughout the year. But on Ash Wednesday, we take off the masks—both the Mardi Gras partiers, and we who want to go deeper into the heart of God. Plan to be present at our 7 p.m. Ash Wednesday Service on March 6th as we begin our Lenten journey. Other ancient rituals offer the same unmasking. Morris Dancing, old English ritual dancing, is another example. In one sword dance, the participants paint their faces—masks of paint. The dance goes on and on with elaborate partnerships and steps and moves of the sword. At the end, the paint is removed from the dancers’ faces. They are unmasked and become who they are. Lent, in a sense, is a dance. A dance of unmasking, a dance toward authenticity, becoming our true created self. For God to love us, we do not need to wear a mask. We do not need to pretend we are someone else, or that we do not make mistakes. We need only ask forgiveness and continue the dance of discovering who we are, stripped of all that masks us, there to find Jesus embracing and loving us all along. He did not need a mask and neither do we. The true journey of Lent is to help us remove those masks as we are drawn more fully into the heart of God. I’m looking forward to being on this Lenten journey with each of you!